Ed and I have two old and very large pear trees at the edge of our yard. Those pear trees usually cause drama every year. This year has been no exception! Usually the ‘pear tree drama’ centers around a few greedy squirrels, who want to take more than their fair share of our pears, and Ed trying to keep the squirrels at bay with his trusty BB gun! (Ed uses BB’s to discourage the squirrels, not harm them) However, this year we have had a whole different kind of drama going on. Our drama begins with what can only be described as ‘pear over-load’. 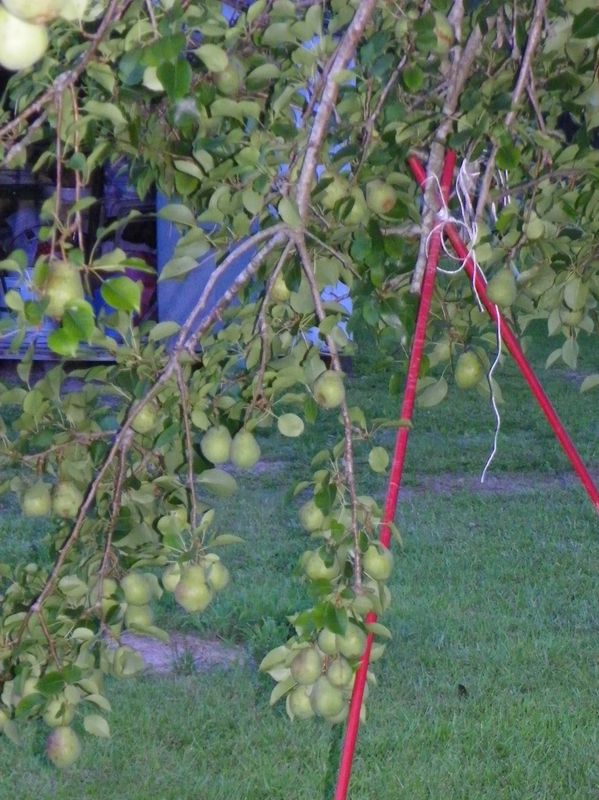 Seriously, we trimmed all of the lower branches on those pear trees, but they’re loaded with so many pears, the branches are practically touching the ground in some places! 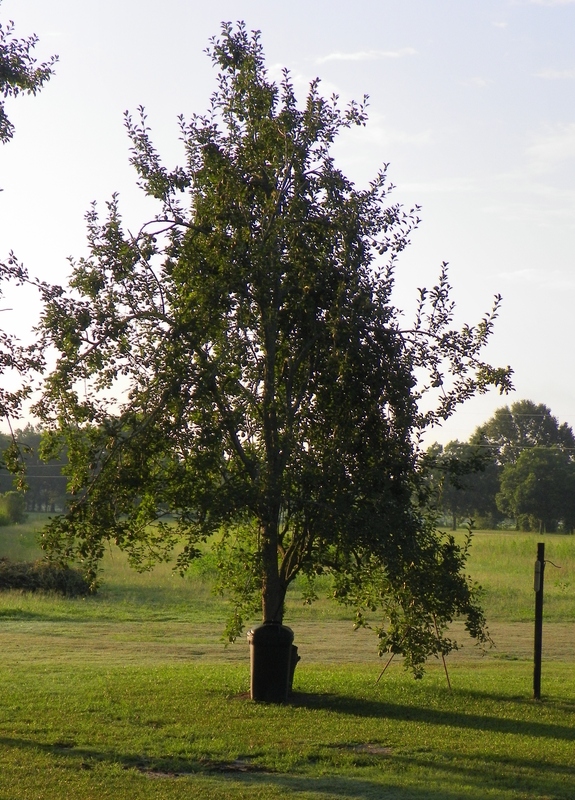 Notice that lowest limb, on the right of the pear tree, with two poles sticking under it. Those ‘legs’ are there for a couple of different reasons. Back in early spring, a mother Mockingbird decided to build a nest in our pear tree–in that lower limb on the pear tree! Ed noticed the nest and eggs right away. As time passed, the limb kept getting lower, and, eventually, the nest began to tip toward the right, too. Before too long, the eggs hatched, and became three Mockingbirds in the pear tree! Ed voiced his concerns about the baby birds falling out, as he continued keeping a regular vigil over the nest. Sure enough, shortly after the eggs hatched, Ed walked outside and found that a baby bird had fallen from its lopsided nest. He happened to have a napkin in his pocket (like always), and he used it to scoop the baby up and place it back in the nest. It was at that point, Ed decided to take some action! He found some old poles and some twine, and fashioned a couple of ‘legs’ for the drooping limb of the pear tree. In doing this, he was able to straighten the angle of the bird’s nest so, hopefully, the babies wouldn’t fall out again. Ed worried that Mama Mockingbird might not accept the ‘fallen baby’, so he continued his regular vigil over the babies in the nest. Mother Mockingbird continued to love and care for all of her babies, even the fallen one. She must have known that Ed was trying to help her babies because she didn’t even put up too much of a fuss over him being near ‘her tree’. However, if I walked near the tree, (along with about five cats following me) that was another whole story! Hell hath no fury like a mother Mockingbird who thinks her babies are being threatened! Mother Mockingbird particularly disliked “Jo Jo”, the tom cat. I’ve seen her dive bomb “Jo Jo” and nearly knock him off his feet on several occasions! Any time “Jo Jo” walked within thirty feet of Mother Mockingbird’s pear tree, you could bet he was going to get attacked relentlessly! I almost felt sorry for the poor guy, but I knew what he’d do to those babies, if given a chance. About two weeks after the babies hatched, I arrived home from grocery shopping just in time to see the last little birdie leaving the nest. It was mid-day, and he was running and hopping across the yard, a few steps at a time. Every so often, he’d stop and spread his newly discovered wings. I held my breath, as I watched, and prayed that no cats would discover him as he headed toward the Japanese Magnolia at the edge of our yard. Fortunately, it was mid-day, and all of the cats were sleeping at this time of day. I’ll bet Mother Mockingbird knew this, too! For a few days afterward, Ed noticed Mother Mockingbird still carrying food into nearby bushes/trees. He noticed a young Mockingbird or two in those trees, as well. We never saw any tell-tale signs of half-eaten birds, so we’re assuming all of the babies safely made it to freedom. I sure hope Mother Mockingbird chooses a different nesting site next year. 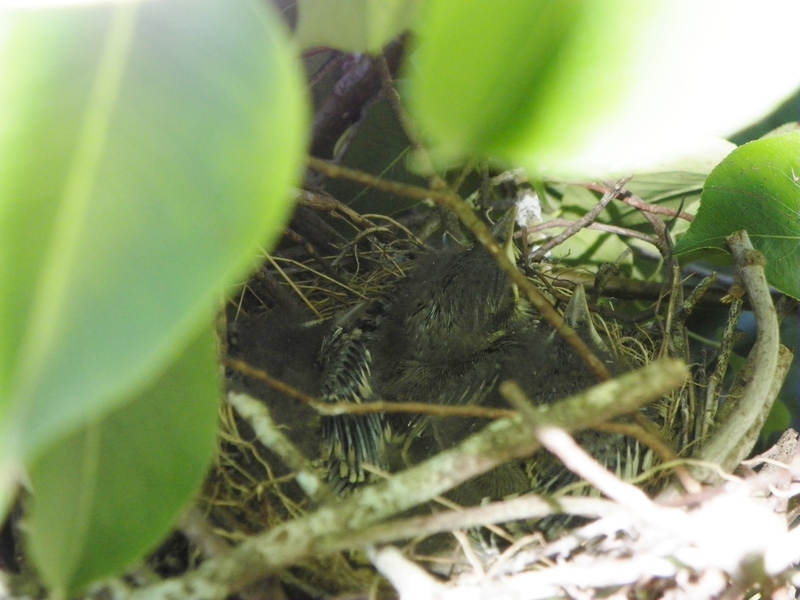 I’m not sure our nerves can take another adventure with three Mockingbirds in our pear tree! 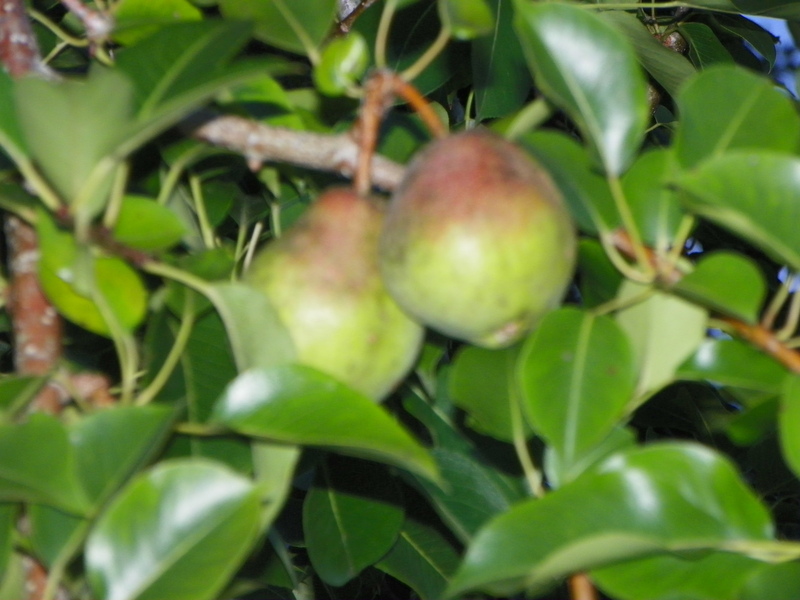 As for the pears, they’re continuing to grow. The lowest limb with ‘legs’ may touch the ground before much longer. Ed’s counting down the days until the pears ripe enough for eating. He’ll gladly remove some of the weight off those limbs then! P.S. There’s been no sign of the greedy squirrels–yet! You certainly have fertile soil , don’t you? All the veggies and now fruit, too! As much as I love cats, I’m glad the mother mocking bird was able to hold her own. I used to have a cat in California, Mystery was his name. He was a notorious birder but the birds (some kind of black bird) had his number. You’d know he was on his way home when you heard the bird cries. He’d have to run from parked car to parked car, ducking under each all the way down the street to escape their dive bomb attacks. Maybe momma mockingbird scared the squirrels away. Such a great post. Thanks for sharing. Couldn’t help but think about the Christmas song with a partridge in a pear tree! We helped a nest last year and now the same tree has a nest with one egg. We ended up putting nest in a box in the dwarf palm tree and the mom still came over to feed them. So glad that they all seemed to have made it out on their own with any harm. Love those pears and pear preserves. Glad babies fledged and flew! 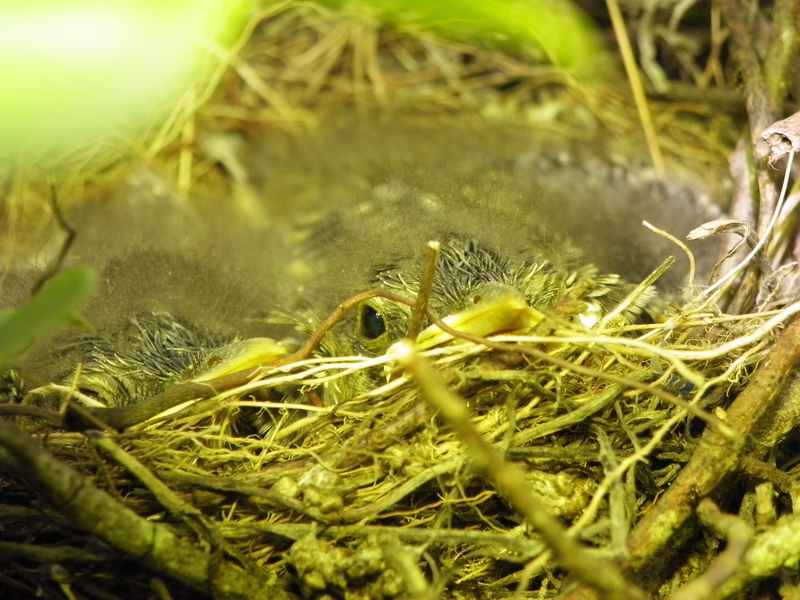 Glad that the baby mockingbirds all survived … hopefully mama will find a different nesting spot next year.